The aim of The Sense of Being Stared At is to offer a plausible scientific hypothesis for a range of so-called “psychic” and “paranormal” phenomena. 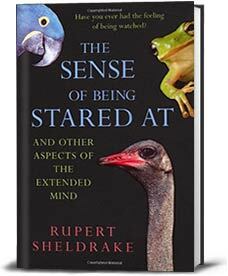 In his book, biologist Rupert Sheldrake catalogs an extensive compendium of controlled research into a variety of psychic phenomena. In all, he examines eight of the most widely entertained theories of “psi,”* the technical term for parapsychological or psychic faculties and phenomena. The one he favors is based on concept of “morphogenic fields, ” a biological process which determines how flowers, fruits and various animal species develop from the embryo stage to take up their specific form. According to microbiological research, the final form of a tissue or organ can’t be satisfactorily explained on the basis of genetics. Genes act by causing the transcription of specific proteins. Yet no genes have been discovered that cause these proteins to organize themselves into specific shapes. Scientists who subscribe to morphogenic field theory believe the final shape of biological structures is determined by energy fields similar to gravitational or electromagnetic fields. These fields are believed to contain “attractors,” which draw systems under their influence towards specific goals. The most dramatic examples are found in bees and termites in which some force (ie a morphogenic field) affects the collective behavior of hundreds and thousands of individuals to enable them to construct an architecturally perfect beehive or termite mound. It seems likely that similar morphogenic fields influence the behavior of flocks of birds and schools of fish. The mental fields created by intentions into the future may also play some role in premonitions and precognition. To understand how the extended mind causes various psychic phenomenon, it’s necessary to entertain the possibility that images we perceive with our eyes don’t merely exist inside our brain, as conventional science dictates. Sheldrake, along with a growing number of biologists, believe that these images occur in front of us in three dimensional space, exactly as we perceive them. In other words, vision involves a two-way process, an inward movement of light and an outward projection of images. This outward projection functions as a morphogenic field. When a person stares at another person from behind, the projection of the starer’s attention means his field of vision extends out to “touch” the person he’s staring at. Most of Sheldrake’s book is devoted to the wealth of controlled studies which have been conducted into paranormal activity. I found the animal studies the most interesting. My favorite involved a parrot with a 750-word vocabulary. When his owner was in a separate room viewing random images, it was clear from his commentary that he was reading her emotional reaction to them. *Clairvoyance is the ability to gain present or past information about an object, person, location or physical event through means other than the known senses, as opposed to precognition, which is the ability to see events in the future. **Psychokinesis is a psychic ability allowing a person to influence a physical system without physical interaction (eg to use “psychic powers” to bend a fork). This entry was posted in Things that aren't what they seem and tagged beehive, clairvoyance, flocks of birds, mental fields, morphogenic, parapsychology, psi, psychic, psychokinesis, sheldrake, ted talk, termites by stuartbramhall. Bookmark the permalink. An absolutely fascinating video, Dr. B. Sheldrake’s distinction between science as inquiry and science as dogma is brilliant, as is his critique of the ten dogma’s. (I found his discussion of “constants” especially amusing.) And TED talks banned this? Indeed, the fact of ‘being,’ the ‘what’ of what is, of ‘what’ we are, individually and collectively, is a mystery that all of our scientific conceits will not likely ever dispel. Life . . . reality . . . awareness . . . perception . . . structure . . . communication . . . the incredible variety and complexity of it all . . .
And indeed, how does morphological symmetry happen? Mind and body? Spirit and matter? Is there a duality? I don’t think that we know . . . I doubt we ever will . . . I know I don’t . . . I tend to agree. For me, the most valuable insight I took from the book (and the video) is the essential role science has to play in revealing the extent of our uncertainty. This role doesn’t fit very well with the harnessing of science and technology to increase the ability of the ruling elite to control us. John Strackey discusses the ossifying effect capitalism has on science (on most areas of knowledge including literature, music, art, philosophy and religion) in his 1933 The Coming Struggle for Power. I tried the link, and sadly YouTube seems to have taken the video down. Thanks much for providing a working link! Most important about this, to me, is the emphasis on the power of inquiry, and daring to ask the questions. Thanks for reblogging, SC. The freedom to ask curly questions is essential in a free and democratic society and it’s disconcerting to see how rapidly it’s being curtailed.